Our ceramic tiles are ideal for Interior wall murals, shower/tub enclosures, and kitchen backsplashes. We use only quality ceramic tiles that have built-in spacers for easy installation. 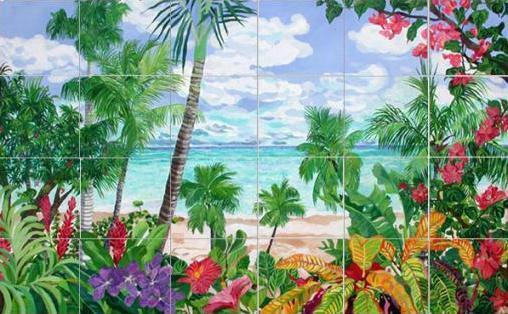 We can resize any of the tile murals pictured on our site. Each installation is unique and we can resize any of our tile murals to fit your dimensions. Whether you need a larger or smaller tile mural, we can help. Our process involves using heat and pressure to apply a 6 part dye onto a specially coated tile. As it cools and hardens, the dye is permanently absorbed into the tile. The dye will never wash or rub off. Our regular ceramic and marble tiles are recommended for indoor environments or in shaded outdoor areas. When exposed to high levels of UV light, colors may lose vibrancy over time. You should receive your tile order within 10 days after placing your order. Allow longer delivery times for orders shipped to the east coast. ** Intended for indoor wall usage only. Image: 17" x 25" / Surface: 17" x 25"
Image: 21.25" x 34" / Surface: 26" x 34"